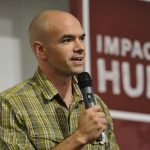 Founder of Climate Disobedience Center, Tim DeChristopher was sentenced to two years in federal prison. Held for a total of 21 months, his imprisonment earned him antopher disrupted an illegitimate Bureau of Land Management oil and gas auction in December of 2008, by posing as Bidder 70 and outbidding oil companies for parcels around Arches and Canyonlands National Parks in Utah. For his act of civinternational media presence as an activist and political prisoner of the United States government. He has used this as a platform to spread the urgency of the climate crisis and the need for bold, confrontational action in order to create a just and healthy world. Tim used his prosecution as an opportunity to organize the climate justice organization Peaceful Uprising in Salt Lake City, and most recently founded the Climate Disobedience Center. Sustainability in our Religious Education programs requires us to approach religious education with an innovative mindset. It requires us to rethink how we do parent and teacher support. What happens at home is more important than what happens at church. We must help our families make Unitarian Universalism what they do and how they live. We can’t control what families do at home, but we can control how we’ve set them up to succeed. This workshop series will focus on how we can set up our parents, our teachers, and our program to best change the lives of our children. Is your Religious Education program sustainable? Are your parents set up to carry Sunday School to other days of the week? Are your teachers set up to succeed every week in class, surrounded by a supportive environment? Does your messaging help children, parents, and teachers sustain their faith? Tim will discuss the “Think Orange” model, show how he’s applied it at the Morristown Unitarian Fellowship, and take you through steps on how you can apply it in your congregational RE Programs. Then we will move into discussing teacher and parent support. Teacher support goes beyond just an initial teacher training. Parent support goes beyond just Sunday morning RE. We all need to do both better. TIM ATKINS has served the Lifespan Director of Religious Education at the Morristown Unitarian Fellowship since 2013. Tim worked for an educational services company in Atlanta for eight years before joining the Fellowship Family, where he served as instructor, curriculum writer, and regional teacher trainer. He is proud to serve the greater Unitarian Universalist denomination through the UUA Board of Trustees and as the founder of an online ministry project, Loved for Who You Are. He previously served the Church of the Larger Fellowship as their Director of Social Media, and as a youth advisor and Religious Education teacher at his former home congregation in Atlanta. He spends his spare time writing, playing board games, trying to change the world, and attempting to reason with his cat Dorothea. Whether we like it or not, addressing the climate crisis is a new core component of our religious education programs. How can we as religious educators help reconnect children and youth with nature, deepen their understanding of our changing climate and associated justice issues, and empower them as climate justice leaders? Join Peter Bowden and the Rev. Amy Freedman for a week-long workshop exploring our connections to the earth, offering resources in climate education, and spiritual tools that will help you design programs and activities that will energize your community. *Note: we’re drawing inspiration, in part, from Dr Scott Sampson’s popular book How to Raise a Wild Child: The Art and Science of Falling in Love with Nature. PETER BOWDEN. A ministry & media consultant with a passion for social media, small groups, and collaborative ministry, Peter is known nationally within the Unitarian Universalist Association of Congregations (UUA) for his work, and is a popular keynote speaker and workshop leader. Peter’s work is focused on helping leaders understand changing technology & culture, and also helping to mobilize more people to take action on climate, including doing strategy, media and education work with a growing circle of climate leaders and organizations. AMY FREEDMAN is Minister of Religious Education at First Parish in Concord, Unitarian Universalist. She says, “Teaching and developing enrichment programs is one of my gifts. Before entering the ministry, I was a Preschool teacher and Children’s Theater Director. I carry my love of learning and dramatic arts into my role as an educator in Unitarian Universalist congregations.” During seminary, she served as a Director of Religious Education at Starr King UU Congregation working closely with the Rev. Dr. Mark Belletini. Amy served the Unitarian Universalist Society of Martha’s Vineyard as their Interim Minister. Amy and Peter and their daughter Liza have been coming to Star for many years. The Teacher Development Renaissance Module is designed to help religious professionals and lay leaders attend to their own faith development journeys asthey guide volunteers in their development as relational, faith-filled teachers inthe context of Unitarian Universalist religious education. Participants will gain the experience needed to use and adapt the module’s material and activities for their own religious education programs. Leah Purcell is the Director of Religious Education at the First UU Society of Albany. She began serving as DRE in 2007. She graduated from Vassar with a degree in psychology and was a teacher, co-administrator and teaching assistant in both public and private schools. She also served in leadership roles supporting and organizing volunteers in various political and community organizations. Climate change, depletion of natural resources, invasion of natural spaces, consumerism, and violence at home and abroad: There are so many crises that need our attention. How do we sustain our souls so we can go forward into the important work of healing the world around us? Come replenish and nourish yourself through SoulCollage. This art form of image making and re-making exposes your deep strengths and reveals the shadows that nag at your psyche, often unbeknownst to your conscious self. In this workshop we will share 6 days of practice and art making to renew you and help you create a sacred space in your life for reflection and creation to sustain your soul. VANDY LEIGH is a teaching artist and storyteller. She became a trained SoulCollage facilitator in November 2011 after attending a Star Island LRE week SoulCollage workshop. She says, “SoulCollage brings your story from the inside to the outside through visual images allowing you to reflect upon and integrate who you are.” Vandy is a certified art educator in both New Hampshire and Massachusetts. She holds a Masters of Education from Lesley University in Arts Integration. She is a life-long UU who served the Exeter, NH UU church as DRE for 7 years. Vandy has happily been a shoaler since she was 16. Sunday, July 17, 2:30 pm (Meet at the East end of the porch) – Meet Star’s Honeybees!! Did you know there is a honeybee hive on Star? And did you know it is maintained by beekeeper and former Pelican, Jessy O’Keefe? Today, Jessy will take us to the hive and tell us about her work with the bees. She’ll show us some of her beekeeping supplies, and the suit she wears when working with the hive. Monday, July 18, 2:30 pm (Meet on the back porch) – See what makes Star hum!!! This Island Systems/Sustainability Tour is designed with kids in mind. The walking tour includes “secret spots” such as the island’s resource recovery center, water system, gardens, poo plant (poop fountain! ), and power facility. Already know where the solar array is? This tour goes beyond the nuts and bolts, taking us to territory not likely seen before. Tuesday, July 19, 2:30 pm (Meet at East end of front porch) Environmental Education Activities For All!! Today we offer a variety of environmental education activities highlighting island sustainability, including celery osmosis, garden planning, solar pizza box oven snacks, and a recycling game. Wednesday, July 20, 2:30 pm (Meet at Well House on front lawn) – Trash Sort Competition!! Engage in a friendly competition to help everyone understand how to sort island waste, with the broader goal of reducing Star’s contribution to landfills. We’ll divide into teams for this friendly competition. Pelican volunteers sort trash bags into recyclable items, compostable items, and trash while conferees help categorize each item to determine which group has done a better job at separating their waste. This is a fun and interactive way to highlight the impact of waste disposal.